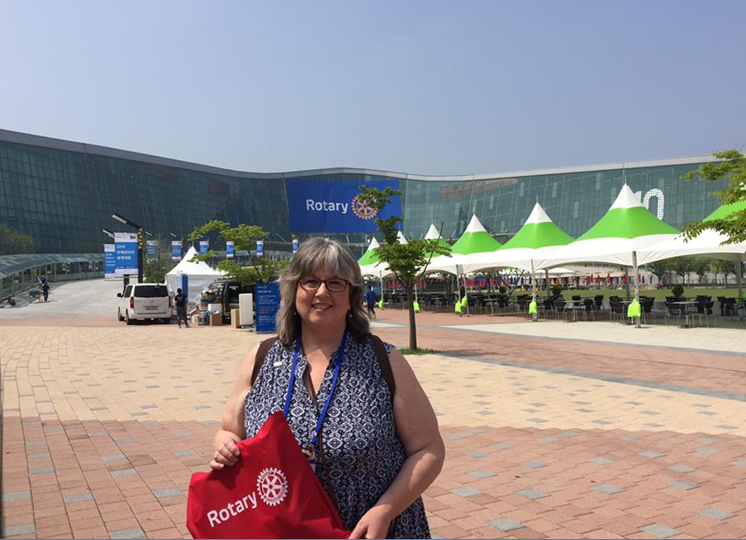 Leah Griffith, our president-elect and fabulous newsletter editor, is in Seoul, South Korea, attending the international convention. In her absence, I (Suzanne Miller) will be trying to do the newsletter. Thought you might enjoy seeing a photo of Leah checking into the convention. Imagine that. We met at Friendsview last week and Todd Engle, the director of the facility, was actually there. At the meeting held at his facility. In person. A first and maybe a last! It was a casual meeting, with lots of talk of 490-lb. bathtubs and kitchen sinks. However, it was also an award-filled occasion. President Jim announced terrific news that our club will give out $47,000 in scholarships this year. He will be awarding them at various schools during the next two weeks. 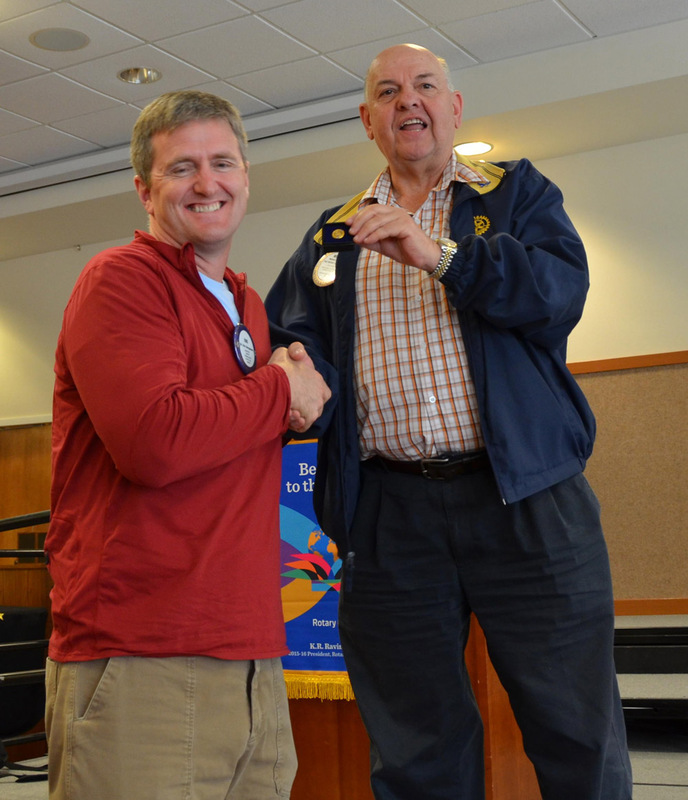 Jim also reported on that our club won a Presidential Gold Citation at the District Conference in Vancouver, WA recently. One of only six clubs to get one, and we got one last year, too! 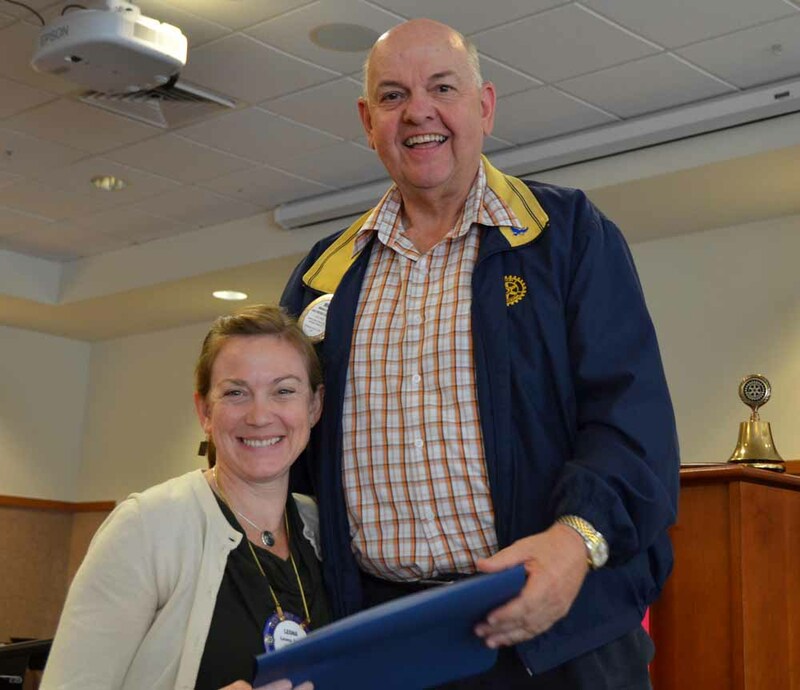 The Presidential Awards are given to clubs that meet or exceed established goals, such as growing membership, performing a sustainable service project, giving to the Rotary Foundation or building awareness of Rotary in your community. Jim mentioned that there are 168 Paul Harris Society members in our District. This year there were 19 new members, and out of the 19, 13 were from our club–thanks to the efforts of Mike Caruso. Nice job, Mike! Mike presented Paul Harris Society awards to six folks: LeRoy Benham, Eric Berquam, Jeff Gilmore, John Kerkanich, Leona Todd and Jan Winters. Congratulations and thank you all! Four guests attended our meeting, and we’re not sure what they thought of us. Britta Stewart, our summer intern who is writing the history of the Newberg Rotary Club, was a guest greeter. Britta is from Tigard, and is a junior at George Fox, majoring in History. 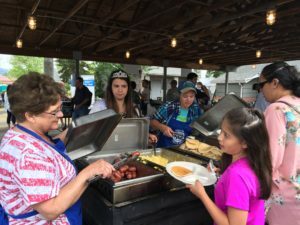 Tara Curcio, an intern with Friendsview, was also there. She is studying at Penn St. to be a dietician. Don’t forget, we’re meeting at Friendsview again this week. Muchos thanks to Auggie Gonzalez for the photos and captions. 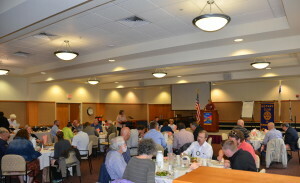 Friendsview hosted us again this week with a great lunch and wonderful hospitality. It’s nice to have such a great place to meet as we wait for our new digs to get finished up. As you may have seen from Paula’s Board Briefs, we’ll be returning to GFU to the new Canyon Commons when it’s completed in early June. 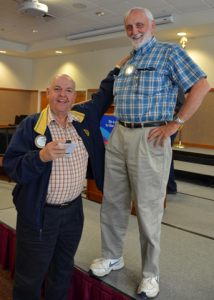 So watch closely for Rotary news on where we are meeting each week. 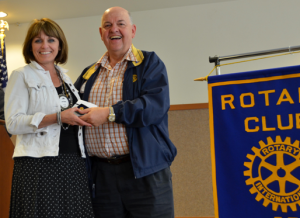 Britta Stewart, our intern who will be compiling our Rotary history, joined us today. She’ll be working with Geoff Gilmore to pull it all together and she’ll be interviewing our members to get information. She’ll be joining us at our meetings this summer. Spencer Veatch and his mom Amy were joining us for Spencer’s now annual announcement about the Boy Scout Memorial Day Chicken BBQ. You can contact Spencer (spencer.boyscout@gmail.com) to have chicken delivered to your business as well. Such a deal. Rubies and Roses is coming up as the premier event for CYFS. Talk to Deborah Cathers-Seymour for tickets. It was the 3rd Wednesday of the month and so the proceeds from the Duck when to the Polio Plus campaign. So Geoff Gilmore is working on getting a 600# bathtub up to his second floor master bath for his wife’s dream bathroom. And it’s taken three different times! What a guy, hopefully this time it worked. Geoff, we expect a report this Wednesday. Dave Benson from the Earlybirds joined us along with Kari Fahrenkoph joined us along with inbound and outbound exchange students. It’s always great to have these young students join us. 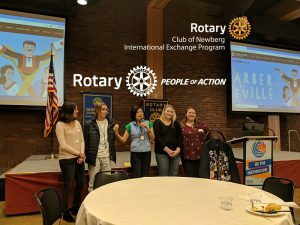 We heard from inbound students Max from Chile (who’s dad is the best Rotary club president in the country as he’s young (45) and all the club members are “old”), and Lookkwan from Thailand who shared their family and country stories. Friendsview was serving Thai wraps, but I didn’t hear if Lookkwan liked them or not. Our meeting was a little different this week. We joined the Early Birds and hosted Chamber Greeters on Friday morning at 8 am at Adec. 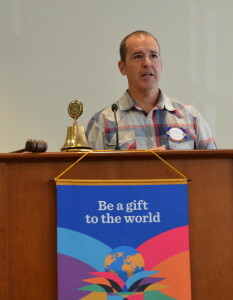 With about 100 in attendance, the story of Rota-Dent was shared with the community by Rotarian, Ken Austin. convinced them to let this be a Rotary project and to use “Rota” in the name. Adec donates 100 units each year to our clubs and the proceeds of the sale of those units goes to the Noon and Early Bird club foundations along with a Rotary club foundation in Austria where the manufacturer of the hand piece (drill to us non-dentists) is also a Rotarian. 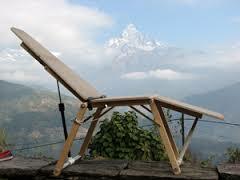 These units, along with the TotaChair that the Early Birds construct, make it possible for hundreds of people around the world to receive dental care. Our club has gone to Guatemala and Nepal and the units have gone all over the world as well as to neighborhoods around the US. 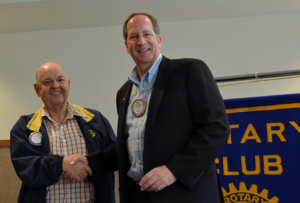 During the meeting Ken provided checks for $100,000 each to our two clubs. 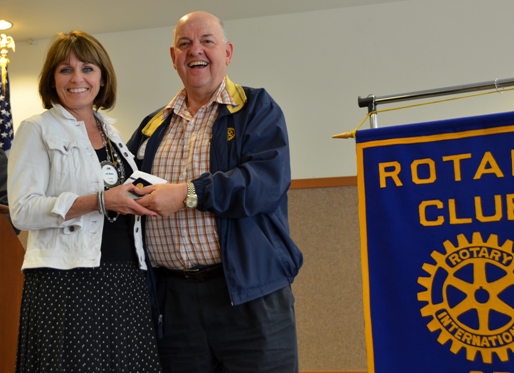 This is an amazing gift from the Austins to support all the projects Rotarians provide our community. 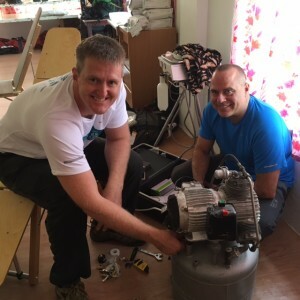 Rotarian Eric Bergquam getting the equipment running in Nepal. 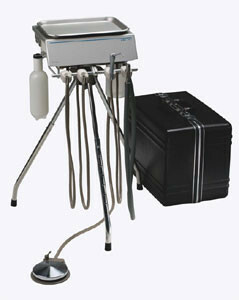 TotaChair and a Rota-Dent unit are in the picture too. 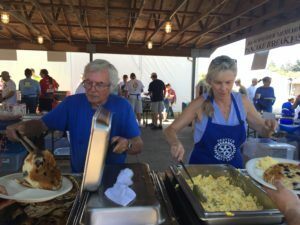 Sheryl Kelsh, Chamber president and Rotarian, related that her father, a dentist, had used Rota-Dent in his own service projects, which made her involvement in Rotary in Newberg especially significant. 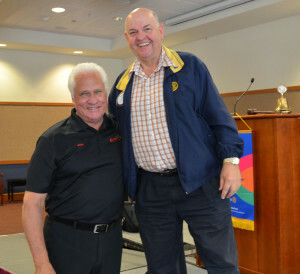 Rotary and Rota-Dent is a three generation Austin project with Ken inventing it, Ken Jr. (Early Bird) taking the lead with TotaChair and now grandson Grant (our club) participating in our service trips to Guatemala and being a lead with the Rota-Dent project at Adec. Thanks Adec and our own Grant Gerke for making this meeting possible. It was amazing to learn more about Rota-Dent than I think most of us knew. It was a great meeting, if you missed it, you missed one of our best. We started our nomad meetings at Friendsview and they welcomed us with a wonderful lunch, table centerpieces and plenty of cookies for everyone. Thanks Friendsview for your great hospitality! 2nd City. He had a great night with a sold out house and standing ovation. I’m sure we’ll be seeing him on Saturday Night Live!. 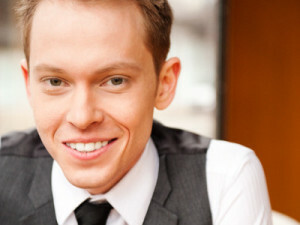 Jack Maxwell III shared about his upcoming wedding on Saturday. 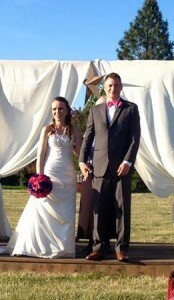 Congratulations to Jack and Vickie. Today we heard from NAMI-Yamhill County. NAMI (National Alliance on Mental Illness) provides support, education and advocacy for those with serious mental illness and their families. 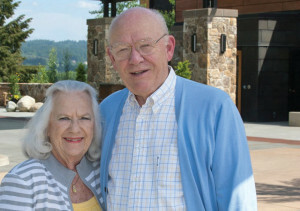 Our own Suzanne Miller is a volunteer with the group and teaches a family support group. 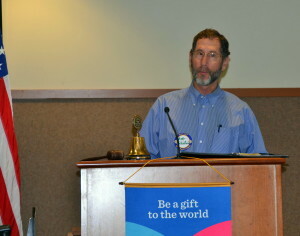 Rob Schulman shared the story of NAMI and what they can do for our community. Rob has been president of NAMI for the last four years and active with NAMI since 1998. NAMI is all volunteers, including Rob. 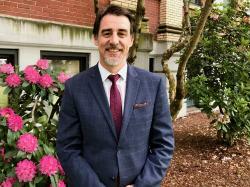 He shared that mental illness is treatable, but getting people into treatment is the challenge. Our jails are full of individuals who are primarily there due to mental illness. Most people with serious mental illness are not violent, most of those who commit violent attacks do have mental illness. 1% of the world’s population suffers from schizophrenia as it is genetic. The stigma of mental illness is the enemy and NAMI works to remove that stigma for families and individuals. It is important to remember that mental illness is just that, an illness that can respond to treatment. We didn’t use to talk about cancer, but now we do, we should talk about mental illness too. We need to support those with mental illness and to support their families as well. NAMI has been working with our local law enforcement to help them deal with mentally ill individuals to bring about a better resolution for everyone. He commented that Newberg Dundee Police have been great about getting training for their officers and responding to individuals appropriately. NAMI has a 24 hr crisis line 1-800-560-5535. 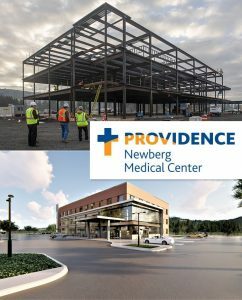 You can find out more at their Facebook page (NAMI Of Yamhill co.) If you’d like to support NAMI, you can become a member for $35 at PO Box 345 McMinnville, OR 97128. Next week, no meeting on Wednesday, but we’ll be at ADEC on Friday at 8 am for our joint Rotadent meeting with Early Birds and Greeters. See you then.